On the centennial of the end of World War I, the event that established Armistice Day (and ultimately Veterans Day), University of Maryland University College (UMUC) acknowledged the sacrifice of the veterans and active-duty service personnel and their families who make up half of its student body. UMUC President Javier Miyares presented the President’s Medal, the highest honor he can grant for distinguished service, to retired Army Gen. Carter F. Ham for his nearly four decades of service to the nation, rising from the rank of private to four-star general. “He has led at every level from platoon to geographic combatant command,” Miyares said, “and his service has taken him to Italy, Germany, Kuwait, Saudi Arabia, Qatar, Iraq and—unique among army leaders—to more than 40 African countries” as the commander of the U.S. Africa Command. 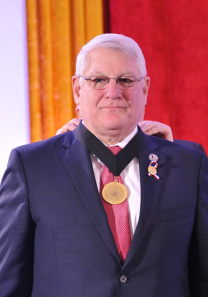 After retiring from the Army in 2013, Ham now serves as president and CEO of the Association of the U.S. Army. “In recognition of your decades of service to our nation, your exemplary record of leadership, your courage and honor in combat, and above all for your dedication to the men and women who serve and have served in the United States Armed Forces, including thousands of students, alumni and staff of UMUC, it is my distinct honor to bestow upon you, the University of Maryland University College President’s Medal,” Miyares said as he hung the ribbon holding the medal around the general’s neck. In his remarks, Ham noted the long tradition of the U.S. armed forces and the commitment of Americans to defend the country dating back to 1775 when the Army, Navy and Marine Corps were established even before the United States was formed. During the ceremony, UMUC also presented its 2018 John W. Vessey Jr. Military Student of the Year award to Gunnery Sgt. Kenny Saavedra, who joined the Marines in December 2004 and has had an outstanding career that started in boot camp at Parris Island and has extended through assignments and deployments at Camp Lejeune; Marine Corps Station Yuma, Arizona; Kaneohe Bay, Hawaii; Iraq; Korea; Thailand; the Philippines; Japan and on Okinawa where he is currently stationed. While he and his wife are raising a son, Saavedra juggles his Marine duties with his volunteer work—assisting at a local elementary school, feeding the homeless and helping with the Special Olympics. 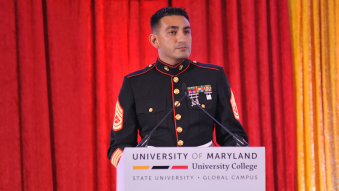 He is a distinguished graduate of the Marine Corps Staff Noncommissioned Officers Academy Career Course, and he now is pursuing a UMUC bachelor’s degree in criminal justice with a 3.97 GPA.